Glenn Ashby World Champ A-Cat 2014 @Takapuna: "TheyFly"
Images above: Richard Gladwell / Sail-World.com/NZ & Beau Outteridge Productions. Yesterday I wrote at the IACA website that this Championship was one of the most striking events I've seeing since I started following High performance catracing. We've watched together lots of flights by now with the AC, the FP, the S.9 and many others. Even Denis Lucci thumbnails from Mischa first foiling at France, and Raphael Censiers's custom flying tests. I think the impact of seeing a well known floating racing craft like the As going airborne while racing at a Worlds Championship, that was the spicy & special ingredient. Together with a still familiar image of the A, as Ashby and Mischa were not flying with some complex double Ts, meters of cables and wands everywhere, it was a clean pristine image of an A-Cat flying good in a racing environment. But now there is no more discussion whatsoever, foiling is here to stay even after the AGM voted to keep rules as they are. There is no turning back now, how possibly you can ban foiling? Going back to straight boards?? 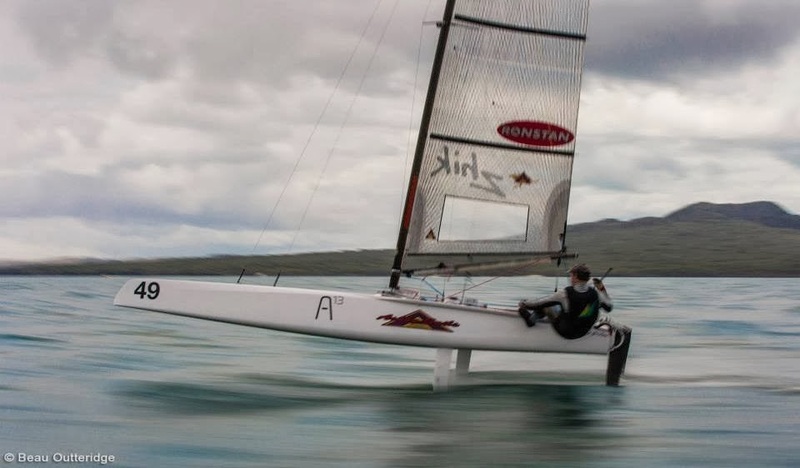 Many we have reconsidered the efficiency of the flying cats after the foiling cats won every single race at Takapuna. is aiming to equal or surpass their own game as the Exploder guys are doing testing and developing new stuff, while going for quality too. Glenn Ashby won the 2014 World Championship at Takapuna, followed by his young Team New Zealand mates , Pete Burling and Blair Tuke. All riding Dnas with standard factory Js shape, Paradox rudders and Ashby sails. Andrew Landenberger on his floating Exploder was 2 points short for the podium after scoring his 'worst' race of the event , a 12. Great event for Landy, always close for the crown. You still have some years mate! Just look at Scott Anderson, hat off to him, by now definitely a legend. TNZ Ray Davies was 5th , and Nathan Outteridge with the flying Exploder optimized for under 10knots ended the event with another bullet to finish 6th overall. Anderson (Floating Exploder/Ashby) and Brad Collet Floating Exploder/Landys) followed Nathan on 7th & 8th, with Adam Beatie (Dna / C-Flex boards) and Steve Brewin (Floating Nikita/Brewin Sails) completing the top ten. I always like to show equipment on the F18 and As , to emphasize how good both Class rules works. And although in this event it is clear and objectively demonstrated that Js had an edge (sailed by top sailors...) the top ten had a good mix of equipment. This is what the A-Class is today, the 'May' can be replaced now by a 'We' Fly. We like it or not, Stable flights or not. This is what it is, period. People talking about failure, or banning the pros, or this class should be sailed by 70s year old only, or going OD (check my comments on the H16 Worlds below) are talking nonsense and are being a little bit selfish. You always have to look ahead of your belly and think for future generations, the kids & youth from today are going to be the leaders of the future , and generations change fast nowadays. If you worked hard for the class in the past, you made it for yourself but specillacy for those coming after you. Don´t be like those who banned Herreshoff Amaryllis in the 1900. The Pros are gonna bust your little sorry soul with short straight boards or latest flying tech. The trill to be able to race with them and learn is one of the key assets of the F18 and A-Class. If not for the challenge, for what we sail & race cats? To be comfortably numb you can go and sail many quality OD monohull racing. The level of exposure the A-Class got this past week can only be compared to the effect the AC72s had at San Francisco in the Americas Cup Finals. How to resolve some issues like leaving the rules as is but allowing the cassette (not a common sense scenario for the near future) , or fully open them , it is not a matter any social media , SA forums or this website can resolve. We only show or discuss what we see in our personal manner, but the future of the class is decided by its members. To start, they have a Class where many people are now eager to enter, they have a peak of promotion and exposure. Theirs is the responsibility on what to do with it.